Extreme Metal artisans Enslaved will be bringing their 25th anniversary celebrations to Australia’s east coast in October 2016. The format for these exclusive Australian only shows will see Enslaved presenting two full sets over the course of the evening. Furthermore, fans can get involved in the song selection process! Set One: Tales from Mythological Forests: a collection of material from the earlier chapters of Enslaved’s career. The set will commence with an earth shuddering start to proceedings by drawing on early albums such as Frost and Eld. With the foundations destroyed, the band will progress into the heart of their career, focusing on the period when Enslaved uprooted and developed their sound - songs from Below the Lights and Isa'will keep fans’ hearts racing and fists pumping. In many respects, whilst centered on earlier material, this is a brand new show for Enslaved. Set Two: Spinning Wheel Ritual: Enslaved look firmly to the future, visiting the more recent chapters of the Enslaved story. Their progressive nature will take centre stage, with songs from albums Vertebrae, RIITIIR and In Times arranged together for the first time. The focus here will be a redefinition of Enslaved’s creative force, with the band pushing towards new boundaries and reaching new audiences whilst staying true to the band’s principles, and to those fans who have followed Enslaved since the very early days. 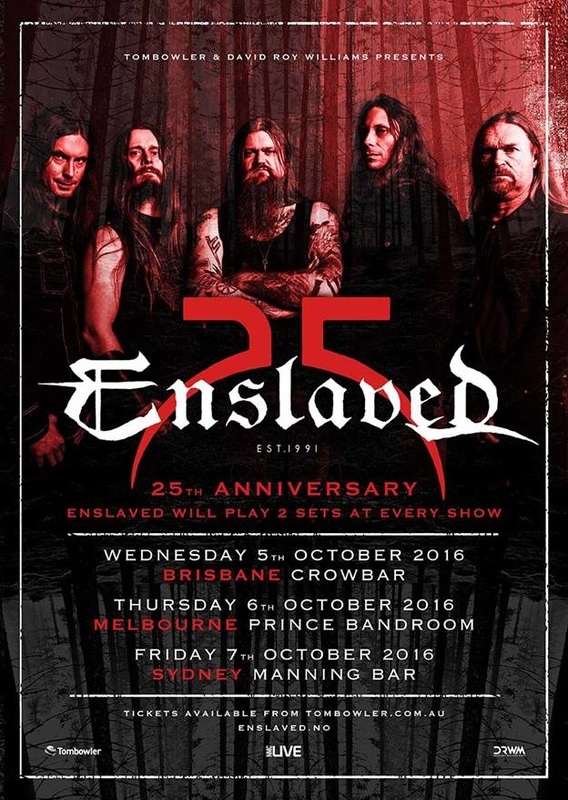 Enslaved’s 25th Anniversary Celebrations will deliver Australia’s east coast fans a chance to witness Enslaved at the peak of their prowess in shows they have never seen before and will never see again. Whatever you do… don’t miss this! Setlist selection: 16 old school and 16 new school songs will be selected by the band and fans that purchase tickets before the end of June will be able to vote on which songs make the final cut. There'll even be a track from 2003's Below the Lights on offer in each set... Finally, one lucky fan will win the ability to attend the band’s soundcheck. VIP Meet & Greet tickets will be available for all shows.